Today I talked with Ariane about the significance of thousands upon thousands of people lining up at the borehole in Tangarwachane to get clean water. The fact that people are traversing great distances (as much as 120 miles) to get water indicates the depth of the catastrophe all around the region where there is no water to be found. Unfortunately, the rains should have started over a month ago, and the lack of rain at the start of the already short rainy season also has great implications for future food production. The Tangarwachane borehole is meant to serve four camps, four villages, and nomadic camps passing through, as well as their animals. 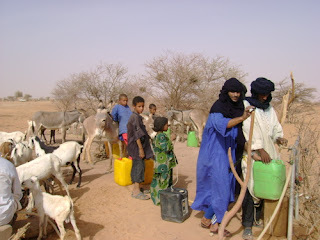 Although the numbers can rise to 25,000, this is not an ideal situation, and only happens because there are so few water sources currently available in the Azawak. Such high pressure on one source can cause a great deal of environmental damage, huge lines and lots of time lost waiting to get to water, less water for each family, and more pressure on the infrastructure which could cause the borehole equipment to break down more quickly. The management committees being set up now to maintain the borehole will have their work ahead of them. A small cue of animals and people....imagine thousands upon thousands lining up here! Amman Imman hopes to decrease the number of people at one well significantly by building more and more water sources, aiming at 2,000 people and 10,000 livestock for the future after more boreholes are built. Ariane says that they knew people might travel up to 30 to 35 miles, but the big surprise is to find that people are traveling 120 miles round trip. But with no rain, the shallow marsh wells having dried up, and the few deeper 100 meter open wells also dry, as Ariane mentioned in her June 22 update, it is no wonder that people would travel these great distances, desperately thirsty as they must be. It is wonderful that water is now available for people at Tangarwachane. But they should be able to find water nearer to them so that they don't have to travel so far. The fact is that one borehole cannot serve the needs of the entire region. Hopefully, with time, this situation will ease up and more boreholes will be built. The first question I asked Ariane was whether people were getting along with each other as they stood in these long lines. I could only imagine how one might feel being so thirsty in such a hot climate. According to Denis' reports, the procession of people and their animals has been very peaceful. My only conclusion is that these people are used to waiting in long lines for water. This has been their way of life. Hopefully, in the future, with Amman Imman's help, the situation will improve. For now, thank goodness for the borehole at Tangarwachane.